Alright this isn't automotive marketing, at least in the sense of this blog's usual coverage. The content here is from DC Shoes. Yet, it really energized me to look into a Subaru WRX STI. Forget the shoes, this commercial is all about drifting as a sport featuring professional Subaru Rally Team USA driver Ken Block. What is drifting? It's basically burning through 50,000 mile tires in 5 miles. Checkout the following video for a high-octane demonstration. 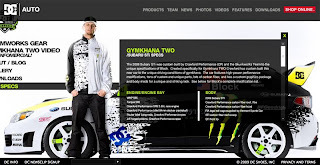 Gymkhana is a special type of drifting sporting event that is done in an open space littered with cones and obstacles. The Gymkhana drifting is featured in this video and truly showcases how cool and intense this sport can get. Ken Block is a professional driver, but he is also co-owner of DC Shoes and Gymkhana Project is in its second phase with this latest "infomercial." You can see the original site here. The whole project showcases the power of Ken's skills but it is all about style and performance something DC Shoes wants to convey and something the Subaru Rally Team has no problem showcasing. And even though this about shoes, it's about the car too. The site features specifications on the highly-modified Subaru WRX STI. It really becomes a great showcase for the car. It would've been nice some collaboration with Subaru, beyond what already exists with the clothing being promoted for the Subaru Rally Team USA. The DC Shoes site is great at providing some extensible content through its blog which effectively communicates the events held around the Project. Access to the products being promoted in the DC store are easy to access and shown in clear, large images. The digital team also put up some excellent screen shots form computer wallpaper to keep fans in constant awareness of the promotion, well at least until something else fills the fan's computer screen. The intensity of the performance video is very cool and something that was all the buzz when it was release a couple weeks back. I saw a coverage from all of the major and most of the minor automotive enthusiast blogs. Maybe next time Subaru can engage better with the DC content; though, to be fair that could distract from the DC Clothing being promoted. Done tastefully, some content extensions with the Subaru brand would be a good thing.